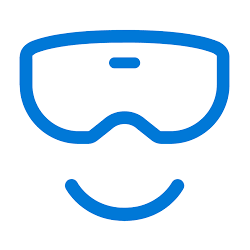 This tutorial will show you how to set up a Windows Mixed Reality headset for your account in Windows 10. A Windows Mixed Reality compatible PC running Windows 10 Version 1709 or later. 1. Pair your motion controllers with your PC if using them. This will be easier to do now than later at step 11 below. 2. Open the Mixed Reality Portal app from your Start menu. If there is a firmware update available for your headset, you will see an Update button available to click/tap on to download and install it. Click/tap on the Use a gamepad or mouse instead link to skip this step if you plan to use an Xbox gamepad or keyboard and mouse instead of a motion controller. 12. Do step 13 (skip) or step 14 (set up) below depending on if you want set up your room boundary or not. A boundary defines the area in which you can move around while you're wearing your Windows Mixed Reality immersive headset. Because you can't see your surroundings while you're using your headset, it's important to create a boundary to help you avoid obstacles. The boundary looks like a white outline inside mixed reality, and appears when you come close to it. When you see it, slow your movements, and avoid crossing the boundary or extending your limbs beyond it. The area inside the boundary should be free of furniture and other obstacles, including the area above you (think about low-hanging light fixtures or ceiling fans). This way, you'll know that as long as you stay inside the boundary, you won't bump into or trip over anything. If you choose not to create a boundary during setup, you can create a boundary at any time. If you choose "Seated and standing,", you'll be using your headset without a boundary. This means you'll need to stay in one spot when using the headset, so that you can avoid physical obstacles and tripping hazards. D) Go to step 15. If you choose "All experiences," you'll set up a boundary, and will be able to use apps and experiences that work with a boundary as well as those that don't require one. You can click/tap on Start over at any time if you make a mistake. F) Go to step 15. You will always be able to turn on or off using Speech Recognition in Windows Mixed Reality whenever you like. 18. Unless you purchased a Samsung HMD Odyssey (which has integrated AKG headphones and an integrated dual microphone array), you will need to get an audio headset (that has both microphone and headphones) and plug that into your headset's 3.5mm audio jack. The 3.5mm audio jack for your headset will - depending on the headset model - be located either on the underside of the headset visor or at the end of a short audio cable coming out of the headset visor. 20. Entering mixed reality a second time is as easy as putting the headset back on while its connected to your PC. You can also launch the Mixed Reality Portal app manually by opening it from the Start menu. Input and audio will route automatically to the headset when you put it on, or you can trigger this manually by pressing Windows + Y on your keyboard.